The first “Open Days” were held during Linssen Yachts’ 50th birthday celebrations in 1999, attracting literally thousands of visitors – a trend which has continued. 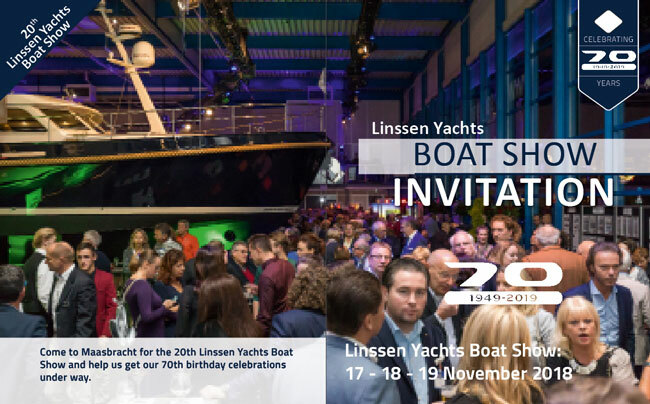 Since then almost twenty years have passed and we will be celebrating our 70th birthday in 2019 at the upcoming Linssen Yachts Boat Show. Has a lot changed over the last twenty years? Certainly. But a lot has also remained the same: as a family business, Linssen Yachts attaches just as much – if not more – importance to quality, to craftsmanship, to security for employees and their families, to safety and, of course, to you, our valued customers, who have chosen Linssen Yachts. The pay-off “We take your pleasure seriously®”, introduced in 1999, has never been so topical, even after twenty years. A 70th birthday is, of course, an enormous milestone for any company. However, it is particularly special for yacht builders because this market is so cyclical and is likely to remain so in future. On top of that, the survival of family businesses is certainly not always guaranteed, as one generation hands over the reins to the next. Linssen Yachts has managed to maintain its position over the past twenty years and to expand its market position by being consistent, making clear choices, continuing to develop new models and technical improvements and above all: by building our relationship with you, our customer. This year’s world first is a “little sister” to the Grand Sturdy 500 AC Variotop®: the Grand Sturdy 450 AC Variotop®. It’s the second yacht in the Grand Sturdy Variotop® series to be equipped with our unique folding roof. During our birthday show we will have our complete range of models on display in our showroom. From the compact 30s to our flagship, the Grand Sturdy 500 AC Variotop®. We look forward to seeing you in Maasbracht on 17, 18 or 19 November. With the following forms you can register for one of the Raymarine and Yachtakademie Seminars at the 2018 Linssen Yachts Boat Show. Please use this form to register one person at a time. Fill out multiple forms if you need to register more people. Please arrive on time! Being to late means not being able to participate.